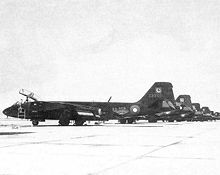 The Pakistan Air Force (PAF) (Urdu: پاک فِضائیہ‎—Pāk Fizāʾiyah, Urdu: [pɑːk fɪzɑːɪjəɦ] or alternatively Urdu: پاکستان ہوائی فوج‎, Reporting name: PAF) is the aerial warfare uniform service branch of the Pakistan Armed Forces, tasked primarily with the aerial defence of Pakistan, with a secondary role of providing air support to the Pakistan Army and the Pakistan Navy. The PAF has a tertiary role of providing strategic air transport and logistics capability to Pakistan. 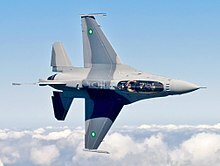 As of 2017, per IISS, the PAF has 70,000 personnel. It operates 1046+ aircraft. ^ quraishi, omar r (27 February 2019). "PAF Sqaudron Leader Hasan Siddiqui upon his return to base from a successful mission where he shot down an IAF MiG 29pic.twitter.com/HxGP17fO9k". @omar_quraishi. Retrieved 28 February 2019.
before we had completed more than of about 270-degree of the turn, at around 12-degree per second, all four hunters had been shot down.